Learn to make attractive leather articles with a professional look by mastering a handful of basic techniques. 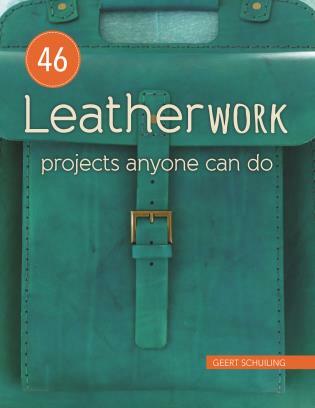 Using the many kinds of available leather, some leatherwork tools, and the designs in this book, you can produce beautiful and functional handcrafted accessories, gifts, and items for your home. Beginners can start small with a simple key fob, then build up to belts, a wallet, and bags, while experienced leatherworkers will find inspiration in the contemporary and stylish designs. Geert Schuiling has always had a passion for making things by hand and has been recycling to create useful and fun items long before it became fashionable. He built up his leather business to four shops and a factory employing 60 people producing watch straps, belts, satchels, handbags, sandals, shoes, and other items based on customer demand. Since joining Woodheads 20 years ago, he has worked with business, NGOs, designers, and customers in styling, pattern making, and producing leather products. He also wrote training manuals and offers training to develop the skills required for making leather goods such as sandals, sheepskin slippers, and satchels. Working alongside well-known designers and interior décor companies, Geert loves creating new items for the local and international markets. He and his family live in Cape Town, South Africa.